U.S. stock index futures held steady overnight with trading muted due to the closure of many Asian markets for the Lunar New Year. About 12% of the U.S. workforce is also expected to call in sick today following last night’s Super Bowl festivities. Wall Street ended mixed on Friday – as optimism from an unexpected surge in January U.S. job growth was offset by a weaker-than-expected outlook from Amazon (NASDAQ:AMZN). Investors now have their eyes set on Alphabet (GOOG, GOOGL), which will report Q4 figures after the bell. In Asia, Japan +0.5%. Hong Kong closed. China closed. India +0.3%. In Europe, at midday, London +0.4%. Paris -0.4%. Frankfurt -0.2%. Futures at 6:20, Dow flat. S&P flat. Nasdaq flat. Crude +0.7% to $55.66. Gold -0.5% to $1315.40. Bitcoin -0.7% to $3405. Today is Cycle Day 2 (CD2)…Price action is benign in overnight trade and range to start the week. Key price edges are marked between 2595 – 2715. Next directional move would be anticipated on breakout from either of these levels. Neutral Bias to begin the week…Stay Focused. Scenario 1: IF price holds bid above 2705, THEN initial upside objective targets 2715.50 – 2718 STATX Zone. Scenario 2: IF price holds offer below 2705, THEN initial downside objective targets 2695 – 2692.50 STATX Zone. 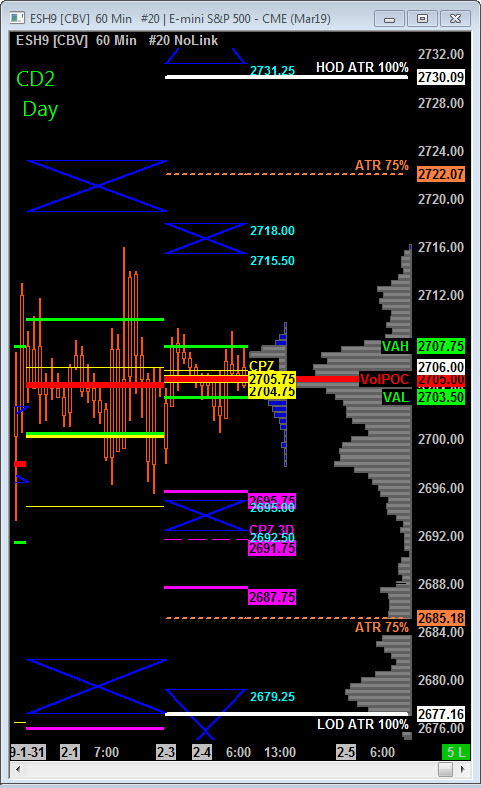 Today is Cycle Day 2 (CD2)…Price action is benign in overnight trade and range to start the week. Key price edges are marked between 6860 – 6930. Next directional move would be anticipated on breakout from either of these levels. Neutral Bias to begin the week…Stay Focused. Scenario 1: IF price holds bid above 6885, THEN initial upside objective targets 6923 – 6931 STATX Zone. Scenario 2: IF price holds offer below 6885, THEN initial downside objective targets 6856 – 6848 STATX Zone.